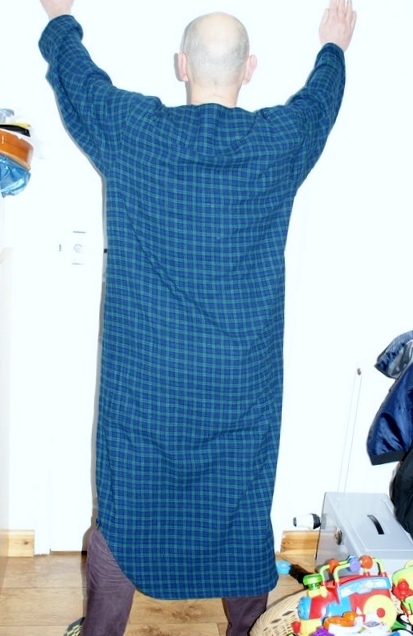 A Wee Willie Winkie style nightshirt for my dad. Headless shot of a very ill Andy doing some last-minute modelling for me. This is a nightshirt I made for my dad for his birthday in January, following repeated requests for another one. Apparently long nightshirts for men are impossible to buy, and my dad likes them really long. He’s six foot, so I had to add another six inches to the length to get it where he wanted it. I made the first version of it in a gorgeous tartan doublecloth about seven years ago when I was just getting started with garment sewing, and I remember it being fairly straightforward, so a likely candidate for a gift with my limited sewing time. I was right about how easy it was. I constructed most of it on the overlocker and the sleeves are set in flat. Even the hem is made before doing the side seams, although I chose to change the order and do mine afterwards as I prefer the way that looks. The pattern instructions for the placket are superb and make the whole thing an absolute doddle. It’s made me think I should just get on with tackling more projects with plackets and button bands, like polo and henley shirts. I do love a good henley. Especially on Andy. One last thing: three cheers for Andy, who agreed to model this for me despite feeling like death warmed up after a stomach bug. These low winter light indoor shots were the best we could manage as I’d only just finished sewing and Dad’s party was about to start! Ever had repeat requests for handmade garments? I have to admit, it does make me a bit wary of sewing for other people! Previous Previous post: Pencil skirts galore!